COMPANY PROFILE Aviva PLC is a leading provider of insurance, savings, and asset management products and services. The company offers life, health, and general insurance along with savings products. Aviva PLC is a London-based provider of insurance, savings, and asset-management products and services. The company offers life, health, and general insurance, along with savings products to customers primarily domiciled in the United Kingdom. In addition, it conducts business in Europe, Canada, the United States, and Singapore. Following years of underperformance, Aviva has been restructuring its operations, divesting itself of complex and/or underperforming businesses, and reducing overall leverage. 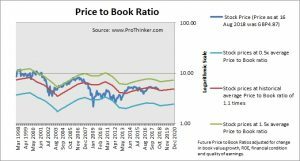 At the price of GBP4.87 as at 16 Aug 2018, Aviva Plc is trading at a Price to Book Ratio of 1.1 times current book value. 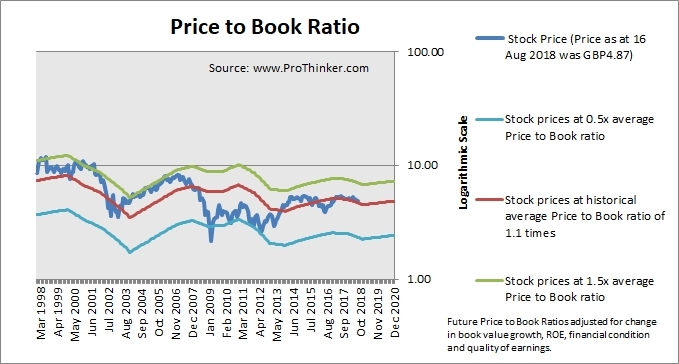 This is a 4% premium to its historical average Price to Book Ratio of 1.1 times.